WALTER Fourie of Mondale High School was a brilliant sprint champion at Western Province Senior Schools Sports Union (WPSSSU) and South African Senior Schools Sports Association (SASSSA) level. SASSSA, by virtue of its strong teachers’ base throughout the country, played a pivotal role at national level in bringing the best of the sport to Griqualand West, Transvaal, Natal, Eastern Cape, Boland and Western Province. 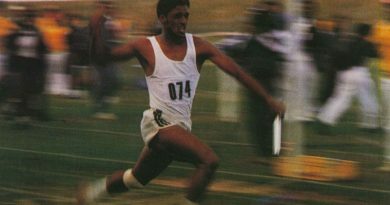 Few could run with the ease and fluency in the way Walter Fourie sprinted down the track. 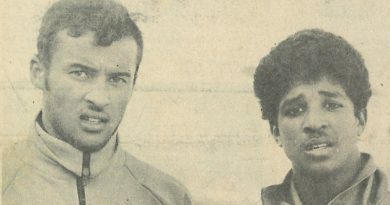 Fourie was the SASSSA boys under 16 sprint champion in 1989 – the height of the golden period of athletics for Mondale situated in Portland, Mitchell’s Plain, a sprawling coloured township built on sand dunes on the False Bay Coast – about 30km from Cape Town central. Fourie was known for his natural, regal and economical style of sprinting. Few could run with the ease and fluency in the way Fourie sprinted down the track. 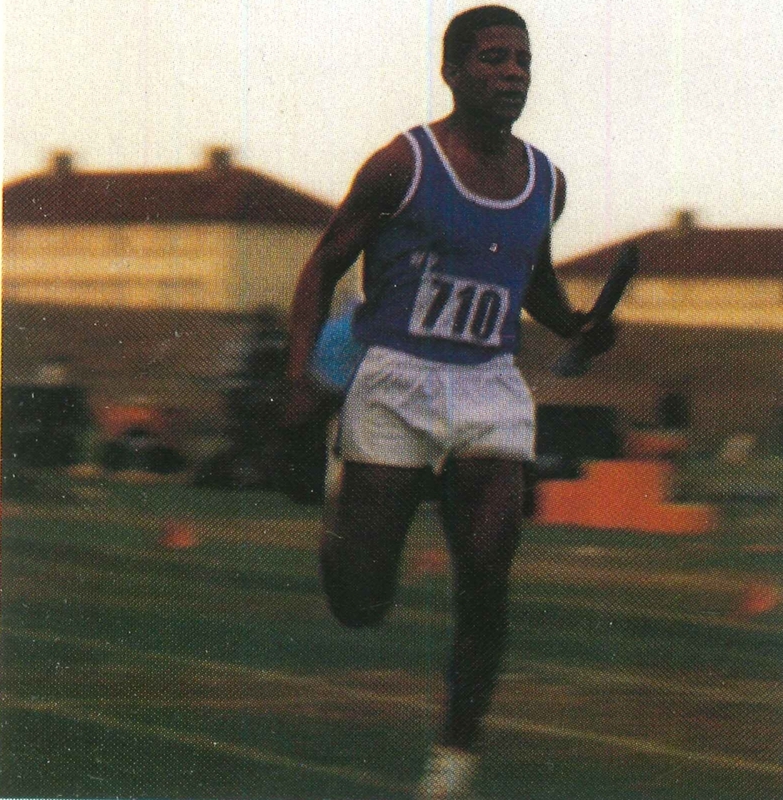 He was part of the Mondale athletics machine who had won the A-Section in 1989 for the second time and the Champion of Champions for the third time as the school moved towards dominating schools’ athletics in Western Province until 1992 when schools’ sport became fragile in the face of sports unity which caused the implosion of school and community sport across race and class which are still being felt today. 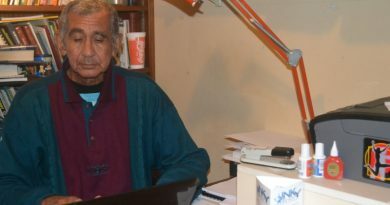 Walter Fourie passed on in September 2016. He was 43. * In the early days (1940s-1970s), Griqualand West was a major union in athletics with much of the SA Championships at club and school level being held at the De Beers Stadium in Kimberley. The SA’s were held on or near Van Riebeeck Day, 6 April with much fanfare and sponsorship from Sir policy of non-collaborationand, later Harry Oppenheimer. Coal-mining magnate C.H. Beck – the father of the well-known Graham Beck stud farmer, mining magnate, and winemaker – was also a keen sponsor in 1953. 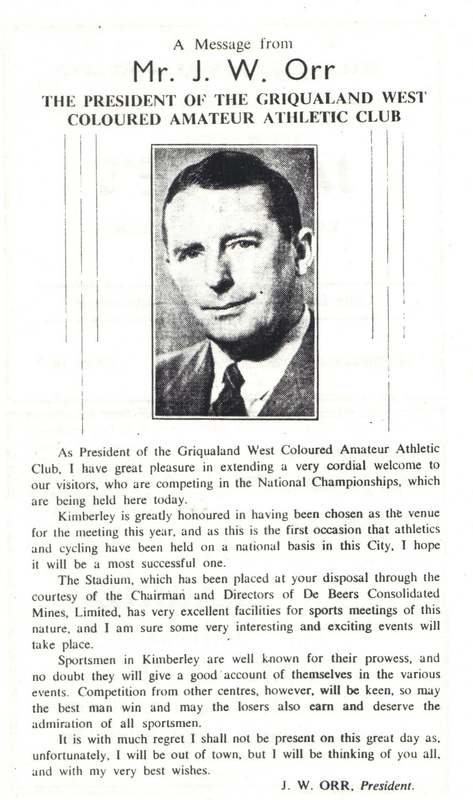 The president of the Griqualand West Coloured Amateur Athletic Club (not union) was Mr J.W. Orr. The president of the Griqualand West Amateur Athletic and Cycling Union was Mr A Moses. Moses is not to be confused with Alex Moses, a top distance runner in the 1950s and 1960s. The president of the South African Amateur Athletic and Cycling Board of Control was Mr W.C. Meyer. 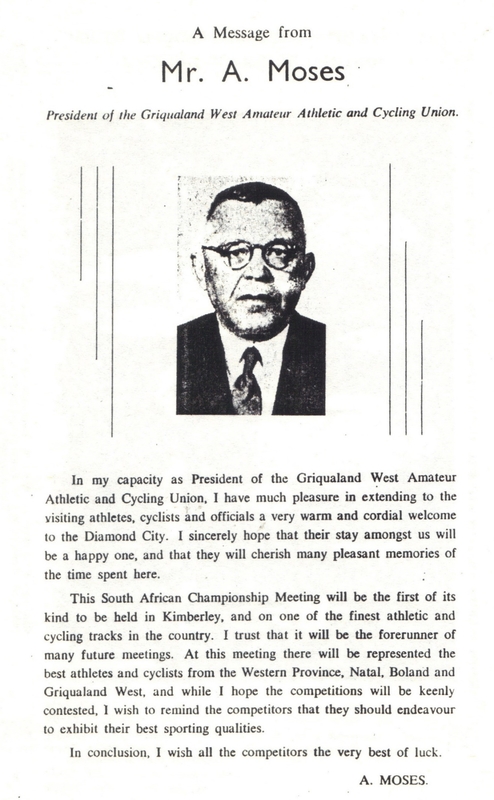 All of them, and more, presented messages of support and well wishes in the official 1953 programme of the South African Amateur Athletic and Cycling Board of Control which contained 54 pages. South African Amateur Athletic and Cycling Board of Control was established in 1946. 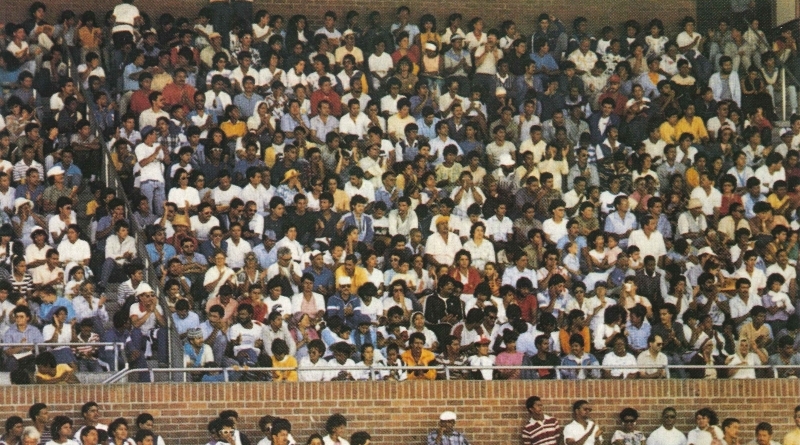 Towards the 1970s, with the policy of non-collaboration instituted by the South African Council on Sport (Sacos), an anti-apartheid sports movement, all of the above had changed in one fell swoop.